The 40GBASE-LR4 CFP module (Figure 2) supports link lengths of up to 10km over a standard pair of G.652 single-mode fiber with duplex SC connectors. 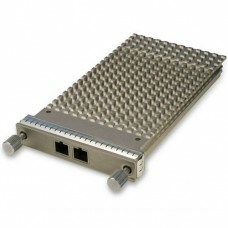 The 40 Gigabit Ethernet signal is carried over four wavelengths. Multiplexing and demultiplexing of the four wavelengths are managed within the device. This CFP module supports both IEEE 40GBASE-LR4 and OTU3 C4S1-2D1 standards.